This spinach plate of mixed greens with warm bacon dressing is a flexible plate of mixed greens in that it tends to be served a wide range of ways. We've made individual plates of mixed greens for our photographs, anyway this plate of mixed greens is additionally extraordinary filled in as a substantial blended serving of mixed greens or even as a layered serving of mixed greens. 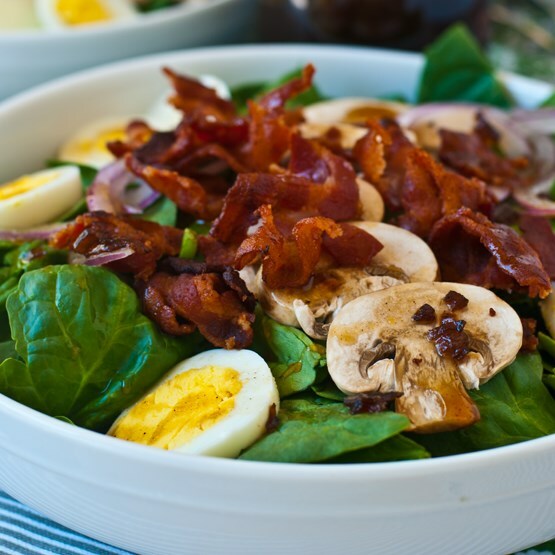 In the event that serving it as a layered plate of mixed greens, select a reasonable, profound sided bowl, (for example, a play bowl) and layer the fixings along the external edge so your visitors can see the distinctive fixings, and after that present with the warm bacon dressing as an afterthought. Notwithstanding how you serve this spinach plate of mixed greens, simply ensure the bacon dressing is pleasant and hot (it will cool decently fast), and all around blended when served. On the off chance that you are serving this as an extensive plate of mixed greens, pour the dressing over the plate of mixed greens and prepare just before serving, or dress the individual serving of mixed greens bits and serve right away. In a medium to large sauce pan, fill ¾ full with water and add the one tablespoon of white vinegar. Bring to a boil and gently spoon in the six room temperature raw eggs in shells, being careful not to break the shells. When the water comes back to a boil, time five minutes and shut off burner. Leave the eggs in the hot water for 15 more minutes. Pour off water, shake pan to crack shells and under cool running water, peel the shells from eggs. Slice cooled eggs into about 4-5 slices per egg. In a large skillet, cook bacon until crisp. Remove to paper towels and crumble or rough chop and set aside. Reserve two tablespoons of the bacon fat and discard the rest. Heat the bacon fat over medium heat and sauté the chopped red onion until translucent, about five minutes. Add the white balsamic vinegar and scrape down pan of any brown bits. Add sugar, mustard and water and stir to combine. Remove from heat until ready to serve. To serve, heat dressing to hot and serve over salad or on the side.